For unofficial releases, see Prestige (4). Like several other prominent jazz producers of the Fifties, Bob Weinstock started out as a traditional jazz fan but soon found himself standing at the cutting edge of modern jazz. He launched his own label – originally called New Jazz, soon renamed Prestige – in 1949 and, during the next decade, recorded such giants as Gene Ammons, Sonny Stitt, Miles Davis, Sonny Rollins, Eric Dolphy, Thelonious Monk, the Modern Jazz Quartet and John Coltrane, often in informal "blowing" sessions. Weinstock turned the reins over to other producers in 1958, and Prestige soon became the leading purveyor of what is now known as acid jazz with its recordings of Jack McDuff, Richard "Groove" Holmes, Charles Earland, and others. 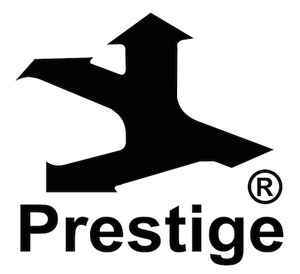 Prestige, its sub labels and its publishing company, Prestige Music, Inc., became part of the Fantasy group of labels in June 1971, Weinstock remaining President. The Fantasy group merged with the Concord Music Group in 2004. 446 W. 50th ST., N.Y.C. 203 South Washington Ave., Bergenfield, N.J.
"HI FI" / "HI FIDELITY" / "HIGH FIDELITY" / "High Fidelity". During 1964 and 1965 the logo appeared on the right hand side of the labels (both stereo and mono). After 1965 the logo moved to the 12 o'clock position.